DON’T MISS THIS ONE! 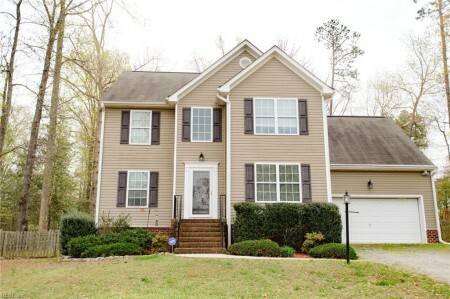 THIS 4 BEDROOM, 2.5 BATH HOME HAS WHAT YOU’RE LOOKING FOR AND THEN SOME! THE FIRST FLOOR FEATURES AN OPEN LAYOUT WITH A FORMAL DINING AREA, OFFICE/STUDY/FORMAL LIVING DIRECTLY OFF THE FOYER, UPDATED KITCHEN WITH BREAKFAST AREA, AND LARGE FAMILY ROOM WITH GAS FIREPLACE. OFF THE FAMILY ROOM YOU’LL FIND A WONDERFUL SCREENED IN PORCH OVERLOOKING THE HUGE FENCED IN BACKYARD. JUST UP THE STAIRS ARE 4 LARGE BEDROOMS, INCLUDING A FANTASTIC MASTER SUITE, AN ADDITIONAL FULL BATH, AND LAUNDRY AREA. ALL OF THIS SITUATED ON OVER A ½ ACRE LOT IN A GREAT AREA OF NEW KENT. CALL TODAY TO SCHEDULE YOUR SHOWING! Send me more information about the listing at 5631 Buckhunt, New Kent County, VA 23124, MLS# 10252831. This 4 bedroom, 3 bathroom home located at 5631 Buckhunt, New Kent County, VA 23124 has approximately 2,301 square feet. It is currently listed for 295000.00 and has a price per sqft of $12,821. This home is currently Active under the MLS#: 10252831. It is listed by Greg Garrett Realty. 5631 Buckhunt, New Kent County was built in 2010. It has Garage Att 2 Car, Driveway Spc parking. The kitchen includes Dishwasher, Dryer, Microwave, Elec Range, Refrigerator, Washer. 5631 Buckhunt is part of the Deerlake neighborhood located in 23124.